I was checking out the trends from fashion week online (probably the closest I'll ever get to attending a show) and noticed that Western wear is back big time. Perhaps it's due to True Grit. I think all of us have a little bit of a cowboy or a cowgirl in us, whether we ever take that trip out to the dude ranch or not. Fashion-wise for me, it's my vintage red cowboy boots. 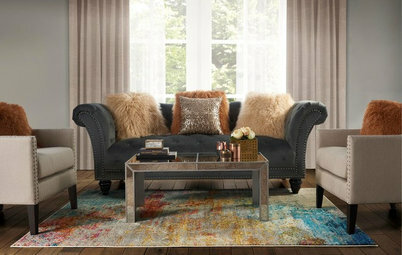 How do red cowboy boots paired with non-Western wear translate into home design? 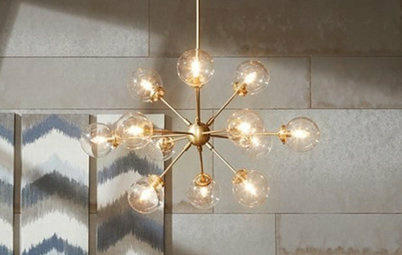 We've seen hints of Rawhide's influence starting to come through the doors of our homes and it's time to declare it a home design trend. 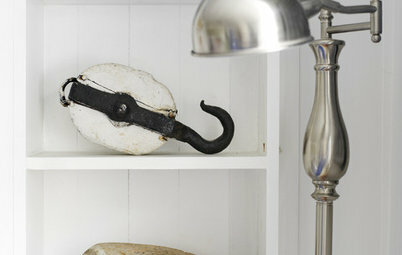 Here's how these hints of homeowners' inner cowboys and cowgirls are popping up around the house. 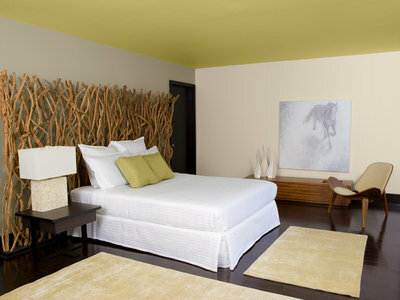 This room is so elegant, yet a pair of horns fits right in. I just love this picture. 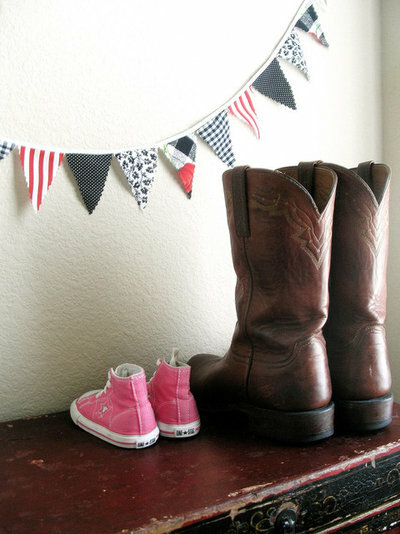 Someone's big old boots next to tiny pink high tops; the photo tells me something sweet about this family. Here's a great example of how we may acquire the cowgirl gene at an early age. 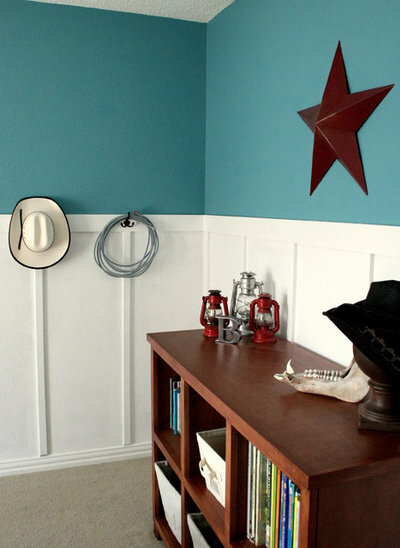 Lanterns, a star, a little cowboy hat are just a few accessories that give this room cowboy flair, while the sophisticated wainscoating and peacock blue walls keep it fresh. 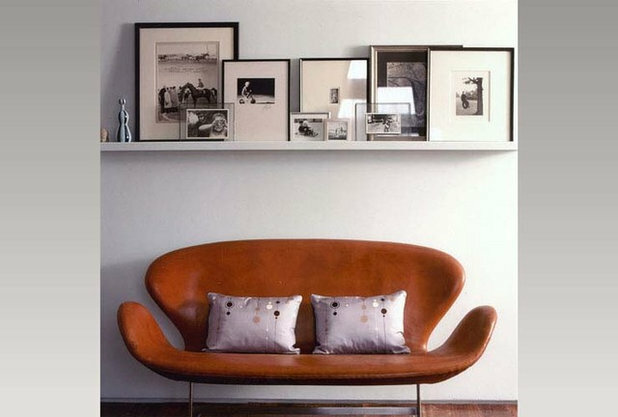 Swan sofa recalls a well-worn saddle. Woven blankets add a Western feel. 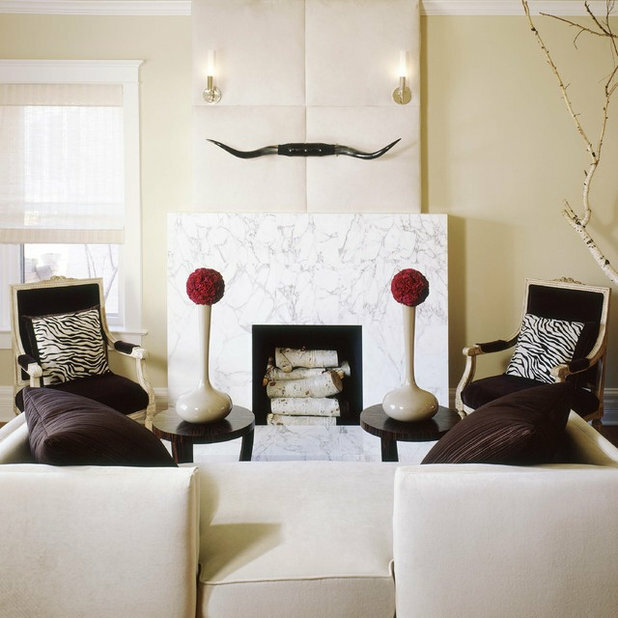 Just a touch of cowhide can bring in some sophisticated cowboy style. 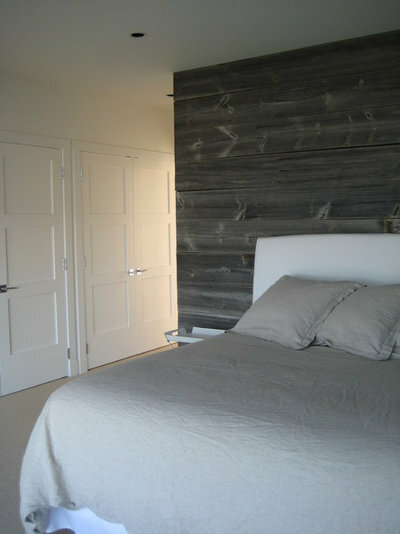 Rough-hewn repurposed wood planks can bring in the feeling of a barn or dude ranch. One of my favorite movie lines of all time comes from When Harry Met Sally: "'Cause someday, believe it or not, you'll go 15 rounds over who's gonna get this coffee table. This stupid, wagon wheel, Roy Rogers, garage sale COFFEE TABLE!" 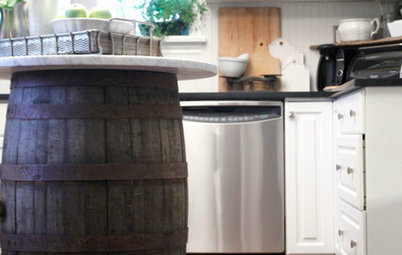 While they may not make the best coffee tables, wagon wheels can make great accents in a landscape. These people are definitely in touch with their inner cowboys. 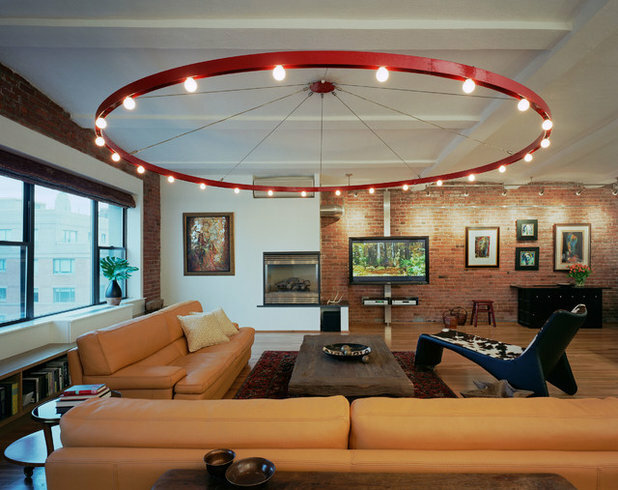 The light fixture reminds me a bit of a rodeo, they have a nice rough wooden coffee table, sofas upholstered in leather that recall saddle leather, and they have covered their chaise in cowhide. 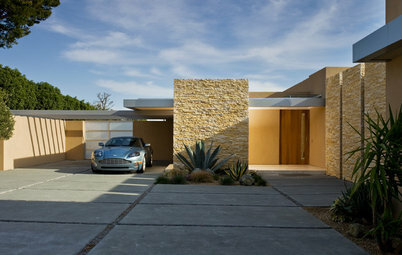 But it's still a contemporary space that does not look theme-y. One big move can show off your inner cowboy. 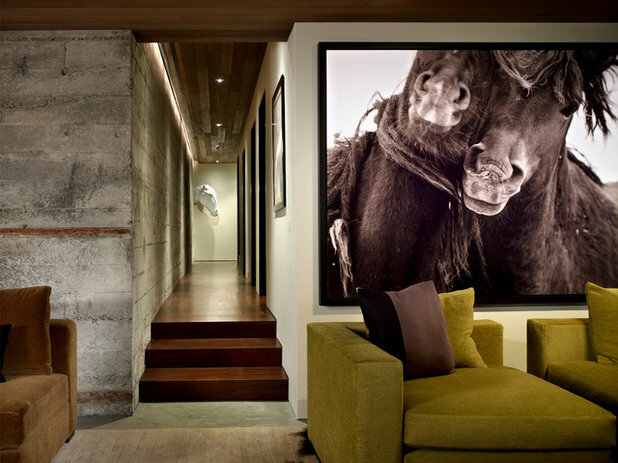 This large horse image makes the room. 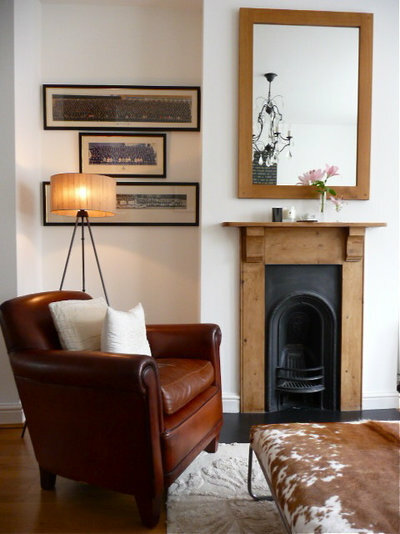 My trend-setting pal Suzannah lives in the country in a very chic log cabin, and you can see clues to her love of cowboys and riding horses around her home. 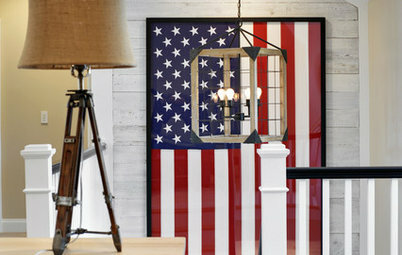 Not all cowboy chic touches need to be done in browns and tans. 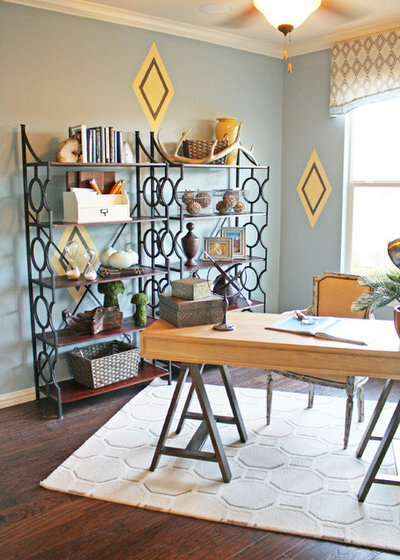 Desire to Inspire's Kim Johnson mixes cowhide with vibrant color. 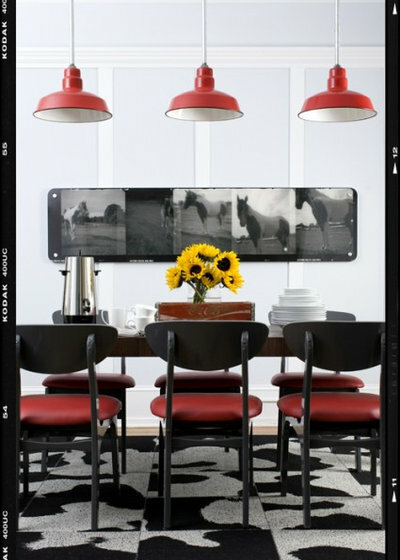 Decor Demon throws in bright touches of red with his cowhide and equestrian photography. 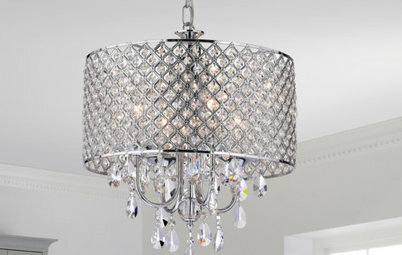 Subtle design details can add a touch of western style. 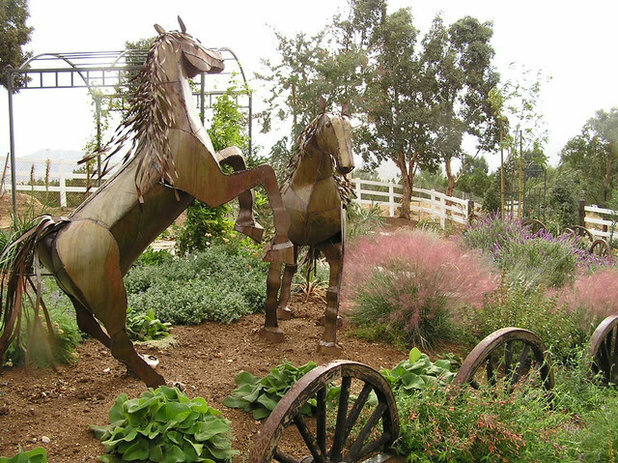 Shelves recall horseshoes in this model home in Texas. 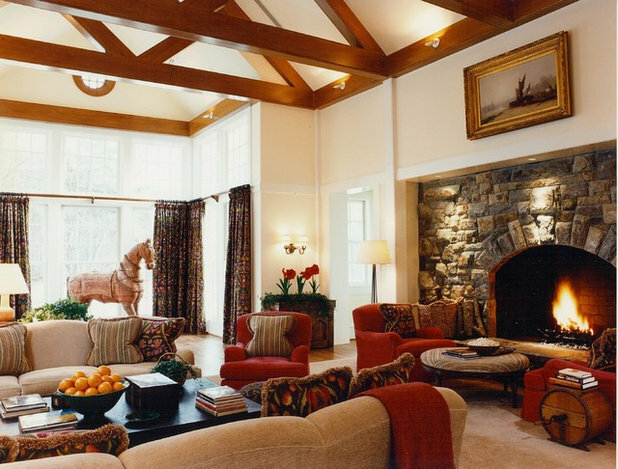 Exposed beams, a fire, warm tones and a big horse sculpture give this room a cozy western feel and make it so comfortable and inviting. 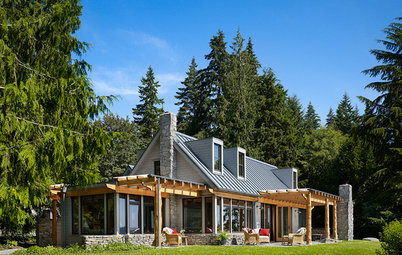 When thinking cowboy chic, think prairie, but not Little House on the Prairie. 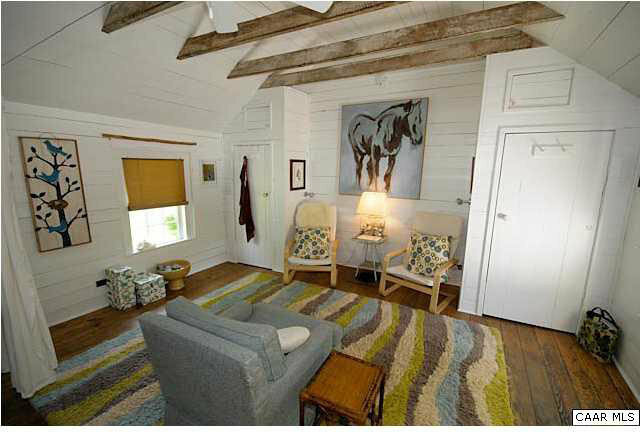 This room does a great job of that; the Scandinavian shell chair takes on a slight saddle feel when paired with the horse painting, and the colors and spare use of furnishings recall the high plains. This person is REALLY in touch with their inner cowboy. Or dairy farmer? 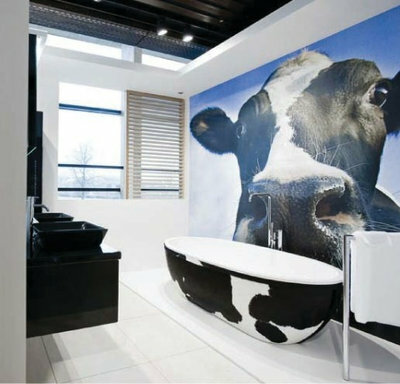 I'm not sure which, but this bathroom is fun as all get-out! 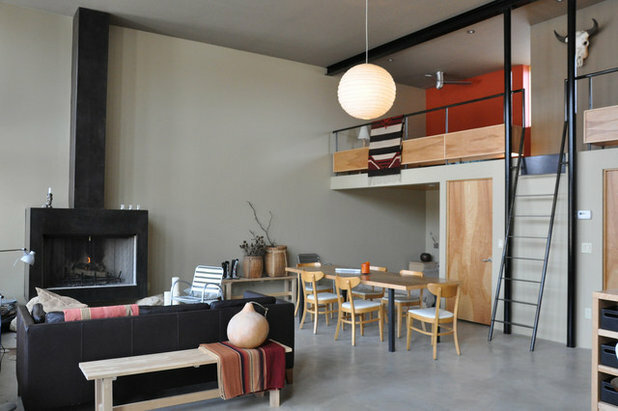 You may want to bring the vast Western landscape into your home in a more literal fashion. 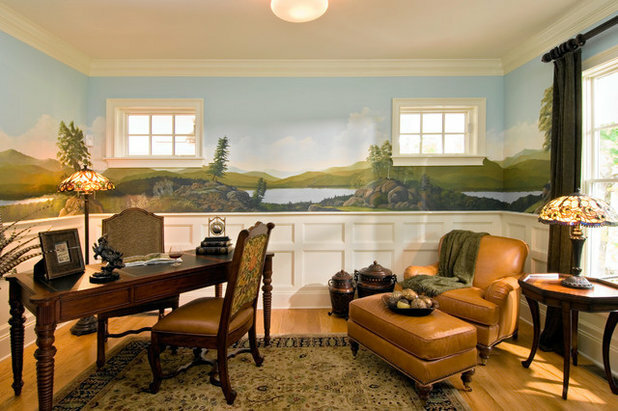 This mural of wide open spaces may make the person who this study dream of being on Lewis and Clark's expedition. Cowboy is just fun if you live in the west. The movers are coming tomorrow and one of the things they're moving is a Hollywood vintage bentwood couch I restored - with cowgirl barkcloth cushions! 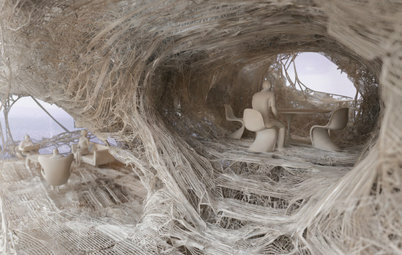 some of these are a stretch some great really unique and imaginative yet livable in a real way not just an artistic way. 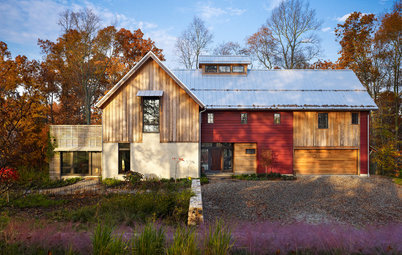 See how local sites and materials create a language rooted to an area. Is your home part of the conversation?